Any gift given after your lifetime that is planned in a will or revocable trust or gifted beneficiary designations. Anyone who is looking to leave a legacy of helping animals and has a will or trust or is ready to create one. They’re customizable, changeable and tax-deductible, but we think the best reason is that you will create your legacy of helping animals after your lifetime! HOW can you give a planned gift? Assets such as retirement plans, life insurance and insurance annuities are not controlled by your will. These require separate beneficiary forms. Retirement plans, including 401(k)s and IRAs are only taxed when funds are distributed to you in life or upon your death. This means that in order to pass your retirement plan onto a loved one upon your passing, the funds will be heavily taxed. If you name Humane Ohio as the beneficiary of your assets upon your death, it is not subject to income taxes and we will receive the full amount, potentially a much larger gift than your family would receive. Life insurance policies are almost always tax-free to the beneficiary, but you will want to speak with your policy holder to find out if this is true of your policy. You can name Humane Ohio to receive a percentage or your entire policy upon your passing. Insurance annuities are considered taxable income when it is transferred to the beneficiary. The beneficiary is responsible for this tax, but if a charitable organization like Humane Ohio is the beneficiary, the tax is eliminated. Contact the administrator or company holding your plan and ask for a change of beneficiary form. 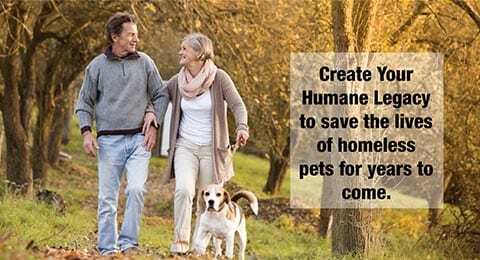 Simply name Humane Ohio and the percentage value of the plan, policy or annuity you would like us to receive upon your passing, and return the form to the administrator. Make Humane Ohio aware of your plans to give a gift to Humane Ohio upon your passing. We recognize that it is your right to change your mind about your gift, but we would like to be able to thank you for your kindness and help our organization plan financially. A piece of property: a specific bequest gives Humane Ohio a particular piece of your property. If you get rid of that property before your death, we will not receive the gift. This can include stocks and bonds as well as physical property. A specific amount of money: a general bequest gives Humane Ohio a specific amount of money. If your estate does not have that amount after your lifetime, other assets will be sold for cash to honor your bequest. A percentage of your estate: a residuary bequest gives Humane Ohio the remainder of your estate, or a percentage of the rest of your estate, after all other bequests, debts and taxes have been paid. This allows you to take care of your family first and give the remainder to Humane Ohio. A gift based on the occurrence of an event: a contingent bequest gives Humane Ohio a gift should a particular event that you specify occur. For example, if you leave your estate to a family member, but that person does not survive you, you can designate Humane Ohio to receive that bequest. An unrestricted bequest allows Humane Ohio to use the assets in the most beneficial way. A restricted bequest allows you to specify how Humane Ohio should use your funds, but please contact us first to make sure we can accommodate your wishes. Plan your estate with an estate planning attorney. If you already have a will or trust, you simply need to update the old document. Share the sample language for Humane Ohio with your estate planning attorney, and they will help you tailor it to fit your specific bequest. Upon your passing, when your will is executed, Humane Ohio will receive the bequeathed property or amount of your estate to aid us in our mission to eliminate pet homelessness. Should you want to modify your bequest before your passing, you may certainly choose to do so. Because you’re not making a gift until after your lifetime, you can change your gift if your circumstances change. For the most customized gifts, speak with your estate planning attorney or financial advisor to learn about other options that may provide you with additional tax benefits. There are a variety of ways to give to Humane Ohio after your lifetime, and your attorney or a financial advisor will help you find the best options.